Guilin is located in the southeast China, and it is one of China’s most popular tourist destinations. We were amazed by its beauty! But not only nature is worth to see. There are also delightful dishes to try! 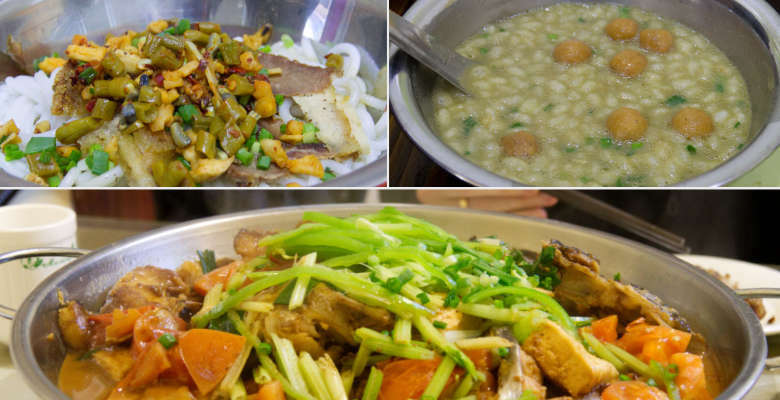 Guilin is well known for its rice noodles, and there are here fantastic. We decided to try them in the stall recommended by the locals. This place looked dodgy, and I was so glad, that the receptionist wrote what we would like to order on the piece of paper – so that we wouldn’t have problems communicating. We tried the dry and the soup version. I liked the dry version more. The dish contained round rice noodles, gravy, thinly sliced pork, and beef. We added to it fried peanuts, spring onions, and green beans. That was just mouthwatering! I could start every day with this bowl of noodles! What a breakfast! Here you can see the place where we have eaten the rice noodles. Don’t even bother to try them in any restaurant; they taste just great on the street! After this, we went to another place to try oil tea. Oil tea originates from ethnic people who lived in the mountains. The tea kept them warm in winter. 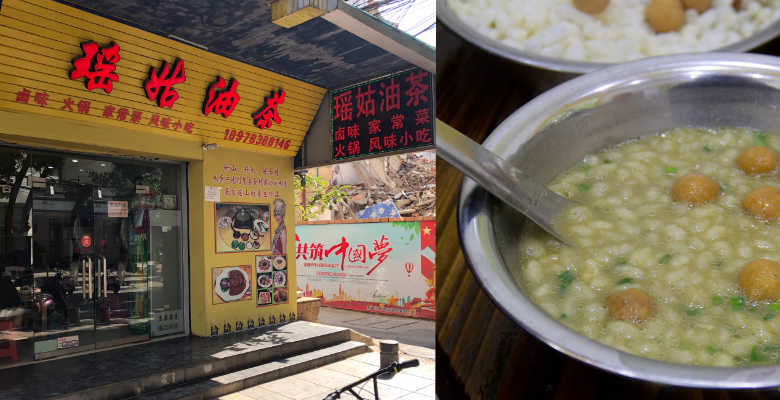 The oil tea had a light green color that comes from tea leaves which are fried in oil with garlic, salt, ginger, and chili. I flavored my tea with spring onions, puffed rice peanuts, and salt. So please don’t ask for sugar! This dish meant to be savory! The taste of oil tea is unique and challenging to describe. It tastes a little bitter in the beginning, but after few spoons, the bitterness disappears. I will still recommend you to try it: You are going to love it or hate it! Here is the photo of a place where they have one of the best oil teas in Guilin! The next day we have decided to visit Yangshuo for one day, and we took a cruise on Li River to reach the city. 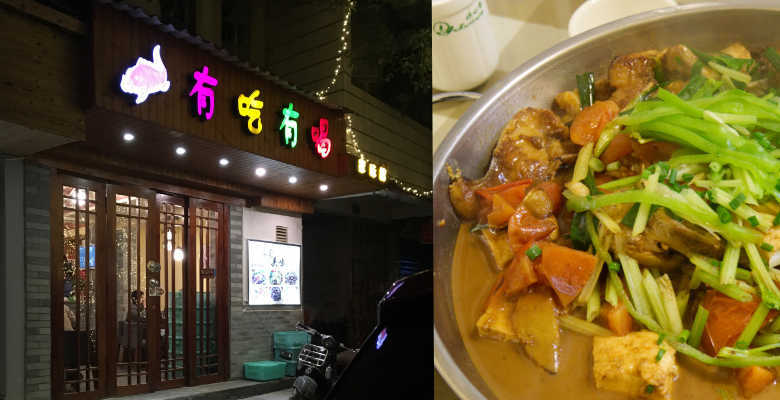 The receptionist of our hostel – Jerry – who lived in Yangshuo for few years recommended this small restaurant for beer fish. 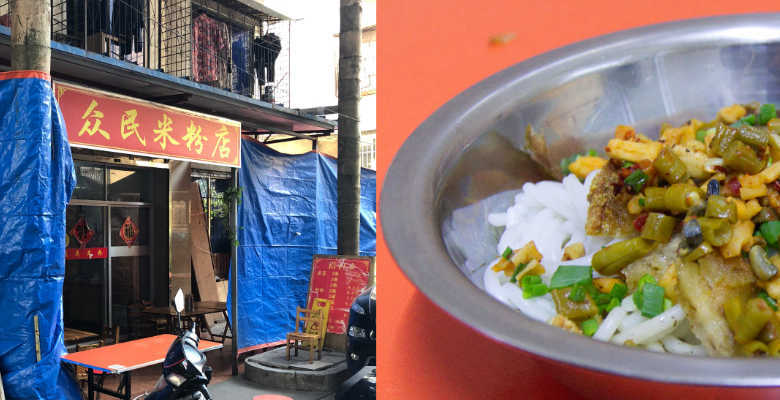 In Yangshuo, we tried the beer fish, which is the cities specialty. Beer fish is a huge fresh carp braised with beer. The dish contained peppers, tomatoes, tofu, celery and some spices that make the sauce taste rich and just fabulous. The restaurant was pretty full, but they have managed to find space for us in a separate room. The beer fish was also at a reasonable price (it’s still expensive for China), if you go to other restaurants in the city center, you might pay way more then here! Here is the photo of the place where we have eaten the beer fish. If you enjoyed this video, please give us a thumbs up or subscribe to our channel. We would love to have you back! Happy eats!